A simple story about an L.A. private investigator? 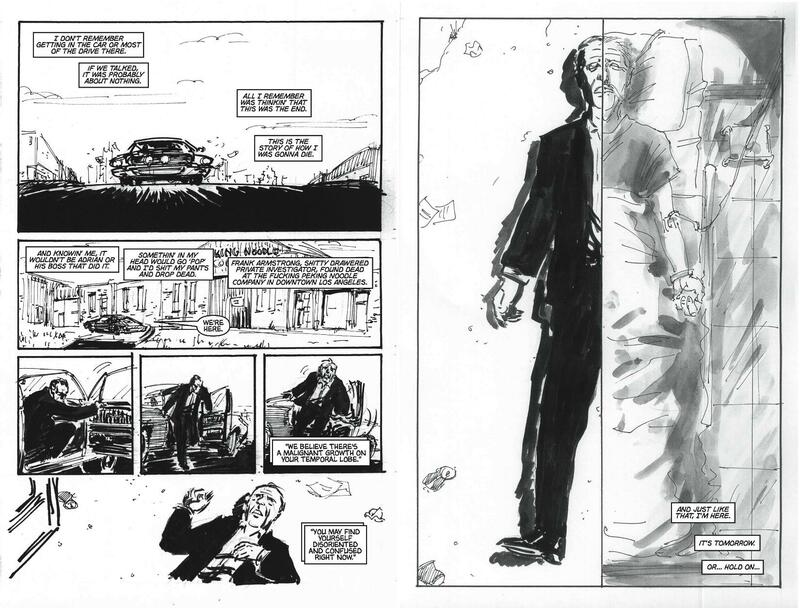 Joshua Hale Fialkov’s story is anything but in the graphic novel “Tumor”. Along with artist Noel Tuazon, both men create a crime noir with a twist set in the modern day city of angels. Guilt, physical and mental anguish, and a search for redemption color this tale that eloquently jumps between past and present. Fialkov’s story is brought to life beautifully by Tuazon and succeeds in not confounding the reader with the periodic time jumps. Fialkov gets into the head of a private investigator that is slowly deteriorating from the effects of a brain tumor. Frank Armstrong is a character who narrates his story as it’s happening and who confuses his horrific present with an even more horrific past. He’s mixed up with all sorts of downright shady characters that belong in any great noir: doublecrossing palookas, dames who may not be who they seem, cops, and other assorted variety of individuals. Everyone is flawed in “Tumor” and that’s just as it should be. People in hardboiled stories are only human. People and situations may seem black and white, but, you may ask, is every moral conundrum so cut and dry? Fialkov has Frank Armstrong narrate his sad tale as Frank does a favor for a local crime boss. Narration is put to extraordinary use as the reader gets inside the degenerating brain of a brain tumor victim. We get to gradually experience the decline of Frank’s mind as his life plummets in a downward spiral. In one moment of humor (which is one of few among such a bleak book), Frank tells Evelyn that he has a “running commentary in my head. Like I hear my thoughts.” Evelyn responds (with a great slight grin supplied by Tuazon) by asking, “You mean you’re narrating?” Frank responds: “Don’t make it sound stupid.” Fialkov utilizes symptoms of brain tumors such as this to make the book retain a realistic feeling (even consulting with a real-life doctor named Arnold Schiebel in order to get the medical facts straight), despite the flashbacks that intertwine with the present day dilemma that Frank must solve. Frank is narrating not only his present, but his past as well. The narration is also perfect for the book because, of course, it’s an attribute of hardboiled crime fiction to have the detective narrate what’s happening in the story. The reader requires no explanation or to be talked down to in order to understand what’s going on in the crime yarn or in Frank’s life. Fialkov and Tuazon work splendidly together in order to not confuse the reader despite the surreal and dream-like feel that the book can descend into at times. 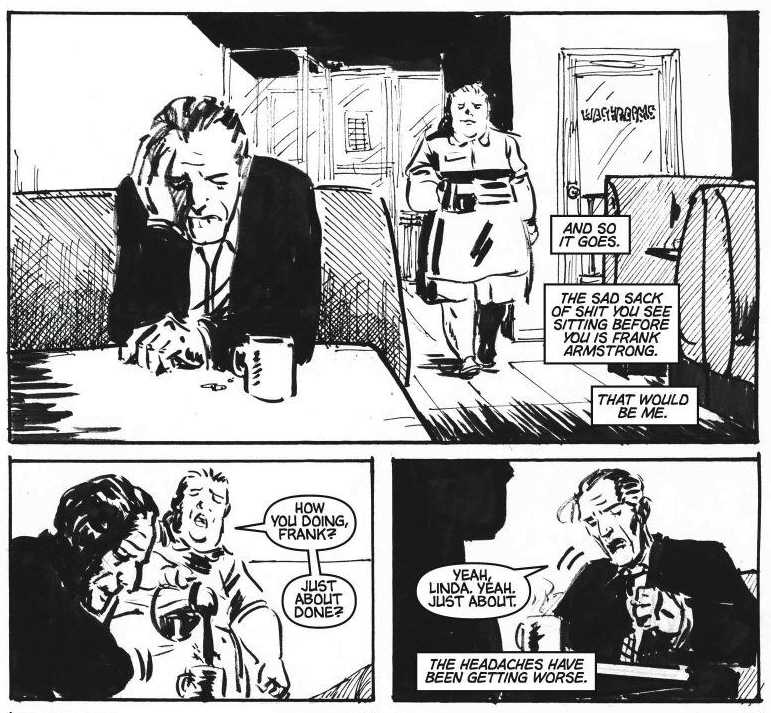 The choice of black and white art, as well as his personal artistic style, by Tauzon (and possibly with the input of Fialkov) is fitting for “Tumor.” Not only does it adhere to the noir trope, but the gritty sketchiness of the art transforms the story into something broken down to its bare essentials: a man up to his neck in pain both physical and existential. In just one of many time shifts that occur in Frank’s head, he mistakes Evelyn for his dead wife Rosa. Evelyn touches Frank’s arm and he is then transported to another time and place with Rosa. The sketchy art, in this flashback and the others throughout the book, then gains a watercolor quality that adds a fluidity to the goings-on. Tuzaon’s use of shifting art style is apropos to Frank’s character because, in one of these “watercolor” flashbacks at the hospital, Frank remembers the doctor telling him that “Time becomes fluid. And your senses start to change.” One particular hotel scene with Evelyn echoes this idea perfectly when Frank’s interactions begin to mirror those of his past ones with Rosa. He can’t tell whether he’s living in the past or the present, and the look on his face (with tears welling in his eyes) will break the reader’s heart in two. Fialkov and Tuazon not only do a bang-up job giving the reader a hardboiled crime noir, but also infuse it with a heartbreaking tale of a man who must deal with a guilt from his past that has eaten him away over the years. He’s a fighter and willing to carry on to the end in order to save a damsel in distress. However, stereotype is not a word in the vocabulary of either the writer or the artist. Frank’s words may not be eloquent, but he knows what has to be done: “Maybe I can save the girl, get her into safe hands, but, then, that’s it. Done, daddy, done. Finally, I can have some peace.” Frank knows its the end and he has no qualms about it. In just those few sentences, his mission toward redemption through death and the end of physical suffering is all that Frank can see in front of him. Fialkov and Tuazon have worked closely together to create a highly memorable character within a masterpiece of a book.